Tired of seeing your clothes and favourite accessories scattered all across the floor, cramped inside your wardrobe or thrown on one of your chairs? In this case, you need a smarter storage solution allowing you to keep your favourite apparel within reach at all times. What Is the Purpose of Wall Fixed Hat and Coat Rail? Inspired by your need, the wall fixed hat and coat rail that we provide is a smart and elegant storage system allowing you to prevent clutter, organise your clothes in a more effective manner and keep your seasonal clothing items and accessories within grasp. Choose to put your favourite garments on full display using our wall-mounted hat and coat rail and make more room inside your wardrobe, while solving your clutter-related problems. 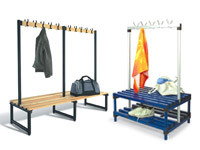 Due to its versatile, stylish design, this item can be installed in virtually any indoor environment, including entryways, hallways, office spaces and households, plus coatrooms featured by larger buildings, such as schools, churches and event halls. Given its utility and elegant design, the wall fixed hat and coat rail is a great option for a broad category of potential clients, including homeowners and business owners looking for practical clothing and accessory storage solutions for their entryways and hallways. These items come pre-drilled for onsite hook fixing, and ensure easier, rapider installations. You’ll love this premium ash hardwood timber hat and coat rail featuring aluminium hooks for its sturdiness, neutral colours and superior practical and aesthetic value. Choose the model with the ideal width, and opt for a configuration that best suits your needs, as well as the particularities of your environment. Please keep in mind the fact that wall fixings are not included. 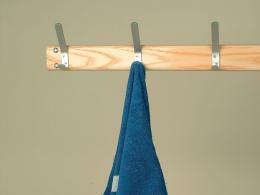 We stock and sell wall fixed hat and coat rails with 5, 7, 10, 12 or 14 hooks, which are easy to mount and offer you the perfect storage solution for the clothing items and accessories that you use on a regular basis. Delivery time for this product is 15 working days; so hurry up and order yours today. 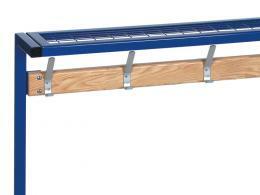 Purchase the versatile wall fixed hat and coat rail and we’ll offer you free shipping and the best price on the market.